One of the hardest things about personally training is countering my clients excuses. Now, it must be said some people just don’t have the intention to EVER get healthy and fit. They find eating a pizza they saw on the way to the check out with their lean steak and veggies, after canceling their session with me because they are tired a valid excuse.–It’s obviously not, but hey at least they are making an effort to change by hiring the personal trainer. And in all fairness that’s fine. They are in the contemplation/preparation stage. I’m happy if I can push them into the action phase. Traveling 5 nights a week so all meals are eaten out. Hosting clients and having to “entertain” 3-4 nights a week. No access to a gym while traveling. Getting 15,000 steps daily except for the days they are on planes for over 20+ hours up to 2x a week. My job as a trainer is to counter all of your excuses giving you no reason to veer off your health and fitness plan. I figured since I know every trick in the book, I should have no problem maintaining my health and fitness while Tom and I travel for a year. I’m quickly finding, however, despite my best efforts staying health and fit on the go is turning out to be a little tougher than I originally thought. 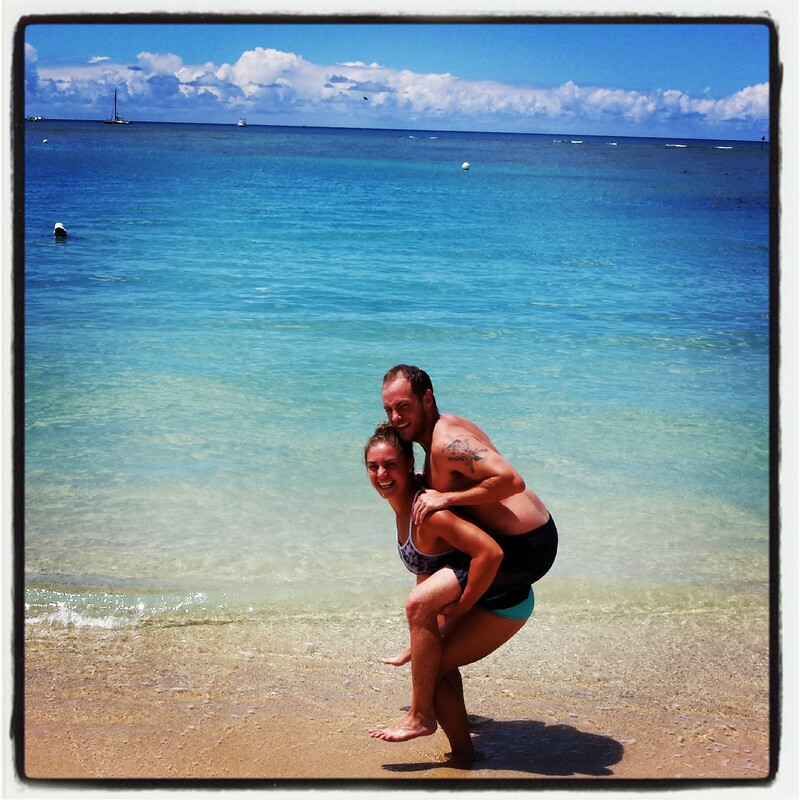 Here are some challenges I’ve encountered during the past week and what I’ve doing to keep up with my health and fitness while traveling. When Tom and I flew to Hawaii we gained 3 hours. Getting up at 5am feels like 8am right now for us. We could have chosen to sleep those extra hours, but rather we’ve decided as we travel west, we’ll continue to keep our internal “clocks” set to wake up early. When we finally get to our resting point we hope that early bird clock stays set. These hours have bought us time to get work in saving the afternoons for workouts and site seeing. They have also bought us a couple sunrise morning runs! If you are traveling east, hit the gym at night. Don’t lay there trying to fall asleep, do something productive with those restless hours. 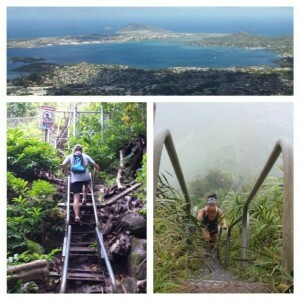 One of those cool sites that we have gotten so see is the stairway to heaven hike. We climbed up 3,922 metal steps to get a an amazing experience and a spectacular view! Make sure when you travel that you take advantage of the natural sites there are to see where you go. Not only are you burning calories, (aka adding to the beers you can consume later) but you are also saving money. Those that follow my blog probably know all ready how much I love my mini bands! They are the perfect workout tool for anyone who travels frequently. I created a body weight/mini band workout that you can do on the go in any hotel room. The one exercise that I do miss, however, is squats. I have always loved doing squats at the gym. I pride myself in being good at them and I hate that I don’t have access to a gym to do them, so Tom and I got creative and have started doing partner squats a couple times a week as part of our workout! Obviously when you travel eating in isn’t always possible, however, that is why it is very important to take every measure to eat in when you can. 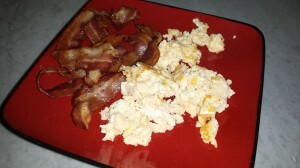 Since we’ve been traveling Tom and I have tried to keep up with our normal breakfast of Bacon and Eggs. We eat dinner in whenever possible, making stir frys, burgers sans bun over veggies, and steak dinners. This has helped save us calories and carbs for when we inevitably end up at a bar. Make it your goal to find hotels that have kitchenettes. If you know there will be times you won’t able to stick to your diet, build in as many opportunities to stick to your diet plan as possible. I’ve been very successful sticking to plan with Appetizer menus. Even if you order protein on a menu, it is often served with carb and most often served with way too many carbs. Even if you just eat the protein, you are left either full or still hungry but either way with temptation sitting on a plate right in front of you. If it’s hard enough to say no when it’s an option on a menu, don’t let the option become a physical item in front of you. It’s near impossible to not eat something that appeals to you when it’s sitting right in front of you. The nice thing about Appetizer menus is you can often find proteins like steak bites, poke bowls, or Ahi Sashimi. I recommend going at Happy Hours because then these items are discounted. If you are still hungry, 2 orders of an all protein and veggie app Typically allow you to stick your diet plan better than 1 normal entree. For Breakfast I like to hit up Starbucks. Their Spinach and Feta Egg White Wrap only has 290 calories and 33g carbs and it also packs in 19g of protein. If I’m eating lunch on the go. I like to get burrito bowls from Chipotle or similar burrito joints or Salad bowls from Subway. Often times in cities you can find similar options at alternatives to the popular chain, but when you are stuck these are great go to options. Dinner time can be more difficult especially when traveling for work, because the location of dining can often be out of your control. Where ever your dinner is scheduled, Google the menu of the restaurant before you go. Have the healthiest meal option in mind before you sit down starving and get tempted by the Fettuccine Alfredo, which has 1200 calories, 99 carbs, and only 36g protein. (36g seems like a lot, but that meals ratios are close to 3:1) A better option at Olive Garden would be the Parmesan Crusted Tilapia with only 590 Calories, 40g Carbs, and 50g of Protein–still very much on plan. Be creative or go with what you know, but don’t say you can’t stick to your ratios on the go. 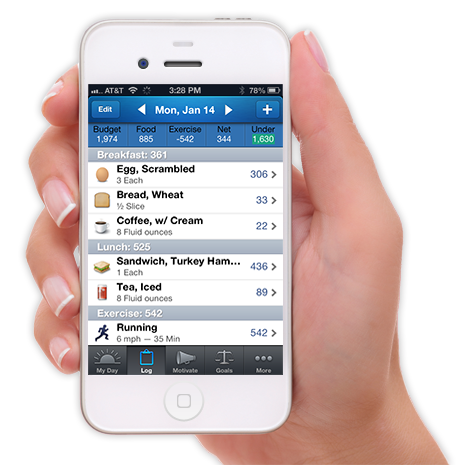 Whatever nutrition choices you do end up making, make sure you track your calories. My favorite app to use is Lose It, because it also keeps track of your overall macro nutrient ratios. All my clients meal track. I love meal tracking, because it is the best way to become educated about what you put in your mouth. The number one mistake people make, however, is they don’t track when they know they’ve eaten poorly. This is the worst thing you can do. Without logging the poor choices, you allow yourself to be in denial about how your eating is affecting your weight. I will never tell you, “You can’t eat something.” Rather just track it. See for yourself how the foods you choose to eat affect your health and fitness. Over time you’ll start to realize better and better which decisions at restaurants keep you on plan and which decisions do not. You number one goal should be to make healthy eating decisions, but when that fails at least track what you did eat. Keep yourself honest. By now you’ve probably had a friend tell you about how amazing crossfit, or Bikram Yoga, or Barre. In fact, you’ve probably been meaning to check one of those classes out yourself. Use the road as an excuse to do that. Google the local studios in the area you are going. Find a class that fits your schedule and try it out. If you love it, you might have just found something new to try in your hometown. If already are addicted, see what other studios are like. Try new instructors. Change is good. You will pick up tips that you haven’t heard before making your practice or workout even better when you do return home. Contact the gym ahead of time and see if they have any specials for new drop ins. Most Bikram studios have $20-30 intro weeks. If you make it a priority to go the entire time you are away that price is very affordable. 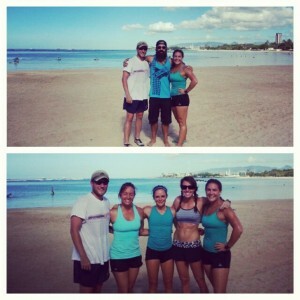 While we were in Oahu we found out that Cross Fit Oahu does a free drop in beach session! We got our booties kick by Ian right on the beach for free! The point of this post is to remind you, we all face obstacles when it comes to living a fit and healthy life, especially when on the road. You can choose to allow those obstacles to get in your way, or you can creatively find solutions to get around them. I hope this post has given you a couple of solutions to some of the obstacles I’ve encountered. 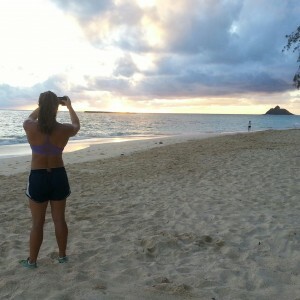 What’s your biggest obstacle that you face when you travel? Do you have the same challenges I’ve hit? If I didn’t touch on your challenge this week, I’d love to help you come up with a solution. Make sure you leave a comment and let me know!